One of the extensively used natural stone, travertine is acquired from limestone caves. What makes travertine special, is its remarkable designs and attractive hues, which deliver an impressive look to your home. The beauty of this stone will be on-pint, when appropriate care is provided with quality cleaners and sealers. Simply cleaning and sealing travertine is not enough to attain the perfect look. D’Sapone’s professional travertine floor polishing service in Atlanta helps in bringing a slight sheen to the stone’s surface. The success of polishing travertine depends on how precisely it is cleaned and sealed. D’Sapone is a travertine restoration service provider, which looks after cleaning, grouting, repairing, sealing and polishing of the stone. Our travertine polishing company in Atlanta delivers the much needed charm to your travertine. Unsealed travertine starts to stain when liquids like coffee, wine or acidic cleaners are spilled on its surface. Such staining also invites mold and mildew. Our artists can renew the stone’s appearance with our patented travertine tile cleaning service. We apply Imperia — a deep cleaner that cleans and disinfects the surface, all at once. It knocks out stains, mold, and etching, and also releases any existing sealers without ruining the beauty of the stone. 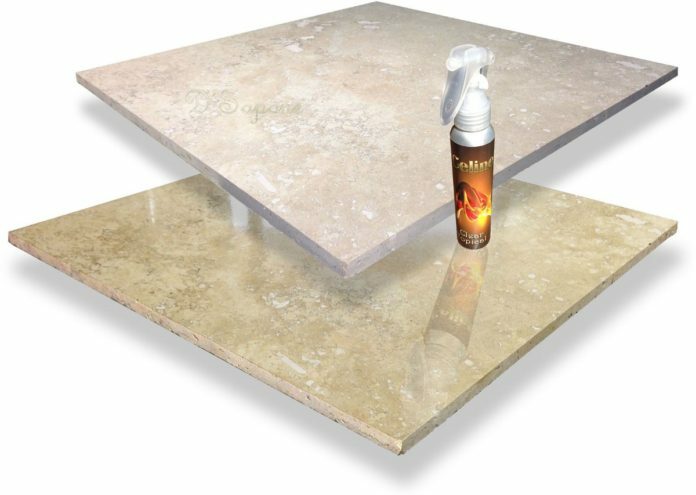 Sentura- a pigmented resin filler, fills the holes and packs the cracks in your travertine tile and grout. Its 1200psi adhesive bond makes it precisely fill stone holes, without falling out of the surface. D’Sapone artists color co-ordinate Sentura with your travertine stone and grout for a natural look. When it comes to restoring travertine showers, you will never find our artists indulging in caulk application as it attracts stains, mold and mildew in a short period of time. In wet settings like showers, caulk peels and wears off from the surface joints, inviting mold, which swiftly spreads itself in humid and wet environment. We substitute caulk with Sentura filler that waterproofs each corner with its smooth and sleek lines, hindering the birth of mold. D’Sapone uses Caponi to seal all the grout lines of travertine. It is a pigmented titanium grout sealer, available in more than 40 colors. Therefore, D’Sapone artists match Caponi to the surface color of the floor to introduce uniformity. It will never damage or come off from the grout lines with the usage of acidic cleaners or scrubbing. Caponi significantly goes into grout, keeping stains, mold and mildew away. Once we clean travertine tile and grout, we thoroughly seal its surface. Although travertine is extremely beautiful, it is prone to damage. Thus, sealing the stone with a quality sealer is key to protect its brilliance. D’Sapone specialists use Repela-Bond sealer, which penetrates into travertine and bears a hydrophobic wrap up. After cleaning and sealing the stone surface, we re-introduce that rich dazzle, which once blessed the stone surface. This is made possible with the help of our travertine polishing experts in Atlanta. We polish travertine with Celine — a clear topical sealer that gives travertine a slight sheen, makes it waterproof and safeguards it from etching issue. D’Sapone provides a 5 year labor warranty on all its travertine floor restoration services. Just fill out our estimate form at https://www.dsapone.com/estimate/ or call @ (770)924–4757 and bring back your dull travertine floor to life. Next articleDIY Furniture : Gold foil could turn any chair into a modern masterpiece.